It really started with a long arc of watching strange videos on YouTube. I started looking around at some science videos, stumbled into strange sushi restaurant videos in Seoul Korea and that opened the door to the Korean Donuts. Strictly speaking, by an American Standard, they're probably more like a Pancake than a donut, and they're dead easy to make. Like they say, anything's easy if you're taught how, so after watching a video of a woman making these things in a shop, I thought it would be fun to try. I purposely made them small, even doubled I'd be hard pressed to call this more than around 200 calories. I know the calorie count because I used my sister Pat's Pizza Dough Recipe for the batter. It's a batter, or dough really, that makes up 1500 calories of some of the best bread I have had since moving to Florida. 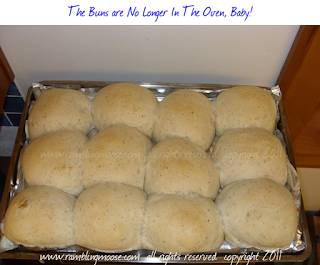 When I make the dough, I break it into 10 equal parts, and roll each part into a ball. Allow to rise for 2 to 4 hours and bake at 450F for about 10 minutes. Check at 9 minutes and every minute past that. Pat's Pizza Dough Recipe is here. If you take one of those dough balls, and split into two pieces, you have the basis for your donuts. Flatten each half into a small pancake that will be about the size of your palm. 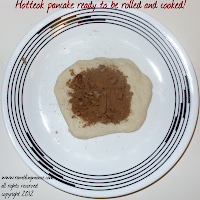 Add 1 teaspoon of Brown Sugar to the center and spread out somewhat leaving a little bit of open dough near the edges. Add a few pieces of chopped nuts - literally about a tenth of an ounce. Dust the brown sugar and nuts with cinnamon. Pinch the edges together to form a ball. The ball should have the filling mixture enclosed inside. Place the ball on a skillet that has been oiled and brought up to medium heat. I used a non stick skillet that has been wiped with safflower oil. I didn't want a strong tasting oil interfering with the sweet filling that would be the result of all that brown sugar melting inside. Cook the ball until the bottom is beginning to turn golden brown. Using a spatula or similar flat object, press down firmly but slowly on the top of the ball until it flattens. You will end up with a pancake shape and roughly the "usual" pancake thickness. Continue to cook on the first side until it looks "done". I went for a golden brown and it was perfect! 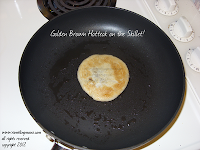 Flip the Hotteok pancake and cook on the other side until golden brown. Repeat until you've made all your hotteoks. Serve hot. 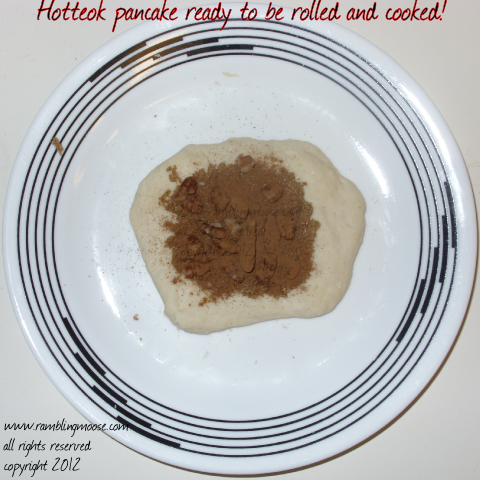 The result is a small pancake donut that tastes like a cinnamon bun. That is to say... amazing. The filling will turn from brown sugar into a wonderful syrup. Trust me it's easier than it sounds. The history of this is that it is a street food served as snacks all over Korea and China. It's made and served in different ways, such as fried in fat like a french fry resulting in a more familiar donut shape. I took liberties with the recipe and the process because my sweet tooth is WAY too strong. Just wanted the right amount. In fact we liked it so much that we made it again the next day. It's a recipe that will be made when I am making rolls. Since I've already gone through the effort of making all those rolls I can take two of them and make two large Hotteok as treats. The interesting thing is that like any "street food", Hotteok are made with a lot of different styles of filling. You can always use the method to make a hot sandwich or a savory treat like a Cornish Pastie. I've already started experimenting with this versatile method of cooking, and I am liking the results. The Video below is a short that shows you all the steps in about 50 seconds.